This 10 mm thick reinforced rubber continuous top cover over a specialised sealed heavy duty foam underlay provides outstanding comfort and durability. The heaviest duty top cover on the world market. moulded edges prevent ingress of dirt/liquid and puddling on the mattress surface. pressure wash or steam clean. Non-slip and non-abrasive surface reduces injuries. Each roll of top cover is 23m or 20 cow spaces long and weighs 535kg. Held in place with stainless steel fixings front and back. A warm, comfortable bed to encourage cows to lie down. 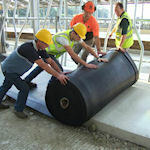 Specialised 30mm heavy duty foam underlay which does not pack over time like crumb filled beds. Foam density tested and proven to provide the optimum balance between softness and durability. Sleeved in waterproof polythene for extra hygiene and durability. The rubber mattress system comes with a 5 year manufacturer's warranty. Available from stock and delivered across the UK. We had this mattress system fitted in 2001. We are still very pleased with it and it has not shown any signs of wear yet." See pictures of our rubber mattress installations on farms across the UK.